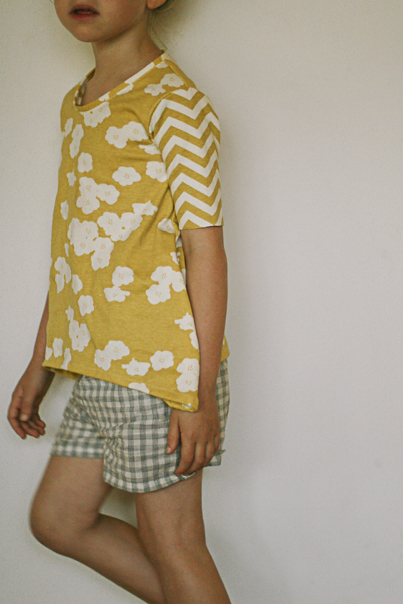 The Banyan is my go to pattern for kid's knit T-shirts - for school tees, for up-cycling and also for pyjamas. 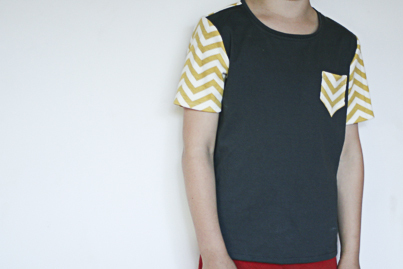 I have tried other T-shirt patterns but this is the one I come back to over and over. * I think in my time I would have made it easily fifteen times. Maybe twenty. What I like about it is that it is a little looser - which means more growing room and more comfortable for the small people. And because I sew my knits without an overlocker the looser fit means less broken seams and a nicer finish. It is also super quick. All in all it probably takes an hour or two. And if you can make more than one at a time I think you can do it quicker. So the details. It is a pattern by Figgy's which is available as a pdf download from Stitch56. There are actually two different shapes. A boys shape which is looser and a girls shape which is more fitted with a different neckline and what I think is called a handkerchief hem. You can see some beautiful versions by sewers on Pinterest here. ** I adore the striped girls versions. They are next on my list. The bit that I really really love about the Banyan is the neckline. In both the boy's and the girl's pattern, it has a lovely shape. However, my favourite thing is that I LOVE how simple it is to put on the neck band AND the total lack of fiddly-ness. Having to fiddle with a curly knit fabric to do a neckline is one of my least favourite things to do when sewing. This technique makes it super simple. 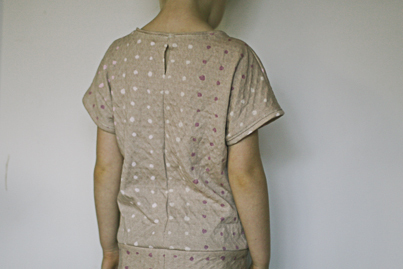 I love this pattern so much that I asked Sophie to teach it at The Craft Sessions 2013***. You can see what was made in her class in the photos below. All of those fabrics were recycled from tees from the op shop. 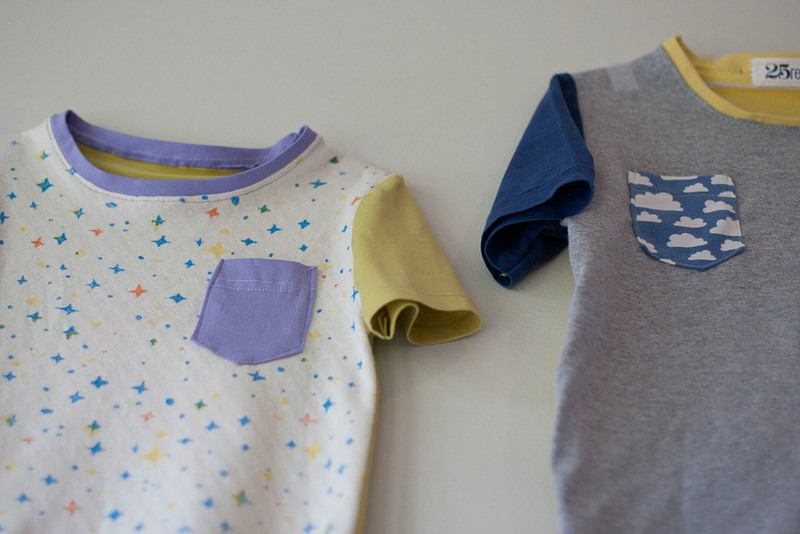 Sophie has also made a bunch of them for her small boys which you can find on her blog. Not the best photo - but fabulous garments! I did the same thing on the horse tee below. 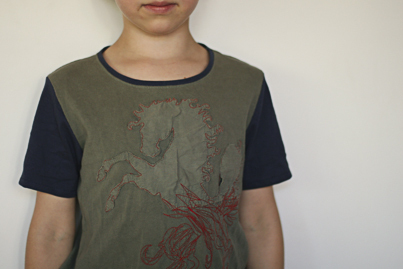 I took a tee that had holes in the arm, that belonged to my partner, and used the existing pattern for the front of the small boys tee. Can I tell you how happy he was that he got a new T-shirt out of a T-shirt that used to be his dad's? This is a winner all round. 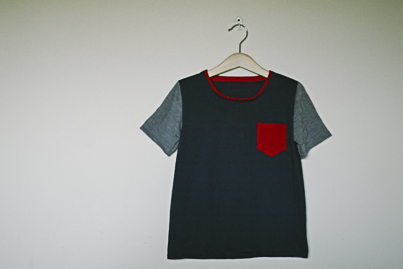 Over the years, I have learnt to wherever possible make the front of the tee a dark colour. 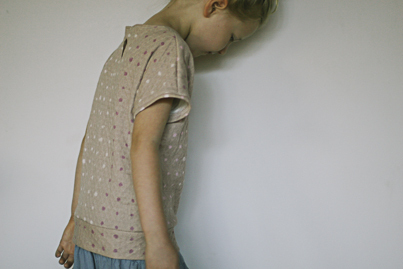 The grubbiness of small kids when eating and playing has meant the end to many a light coloured garment. By making the front piece dark I think I get an extra six months out of them before they become too feral to wear. While I love the girls shape I often tone it down a little to make it less flappy and more practical. A version of this can be seen below in yellow - still flappy but not so much. I know literally nothing about pattern adjustment. I just wing it and redraw lines. It often works out. In the yellow version I just redrew the wings to make them less wingy. I then smoothed the curve on the bottom. It is a little wonky but she is happy. I was attempting to do the half up and half down thing inspired by Brienne but I accidentally cut off the back bit....ridiculous but true. I have included photos of this last pink T-shirt to show you the joy of winging it and the use of the lovely Banyan neckline finish. I found this tee a month ago. Cut out and half made. I have no idea why I abandoned it - it may have been because I wasn't sure what to do with the back. I couldn't look it up because I couldn't for the life of me figure out what the pattern is. It definitely isn't a Banyan. Once I figured out that it would go over her head even if there wasn't an opening, I attached the Banyan neckline finish, then I literally just sewed the two pieces together. Dodgy but such a sweet top. Dodgy can equal joy! Have you used the Banyan? Or is your go-to something else. I would love to hear. *I have tried the Flashback Skinny Tee by Made by Rae - which I really like but hasn't become my basic. Again - I liked it but it hasn't become my basic tee. ** When the pattern was first released it came with some pants. So some of the pictures on that pinterest search are the pants. ***She is back teaching this year! !